There aren’t enough waves for everyone who wants to surf. It’s getting so that there aren’t enough waves for everyone who wants to surf. I started surfing only recently—just six years ago—but the sport had beckoned for a long time. A big part of surfing’s appeal was its beauty—the enviable, effortless-looking grace that skilled wave riders bring to their pursuit. But I was also drawn to the sport’s solitude. When I was young, summering on the eastern beaches of Sydney and New England, I’d seen the lonely hours that surfers spent bobbing and paddling in the water, studying wave patterns and testing swells before suddenly animating to take a drop. I’d felt a kinship with the sea then, too, and spent my days swimming, floating, and bodysurfing until my lips were blue and my swimsuit filled with sand. Decades later, when I finally hefted my first hulking, foamy soft-top board into the waves, I plunged immediately back into my old love affair with the ocean. And I’ve tried since then to arrange my spare time around it: driving out of town to surf on weekends, planning holidays in spots with good beach breaks. Since I learned to surf, though, I feel like I’ve been mainly chasing—and hardly ever finding—that elusive sense of solo communion with the sea. 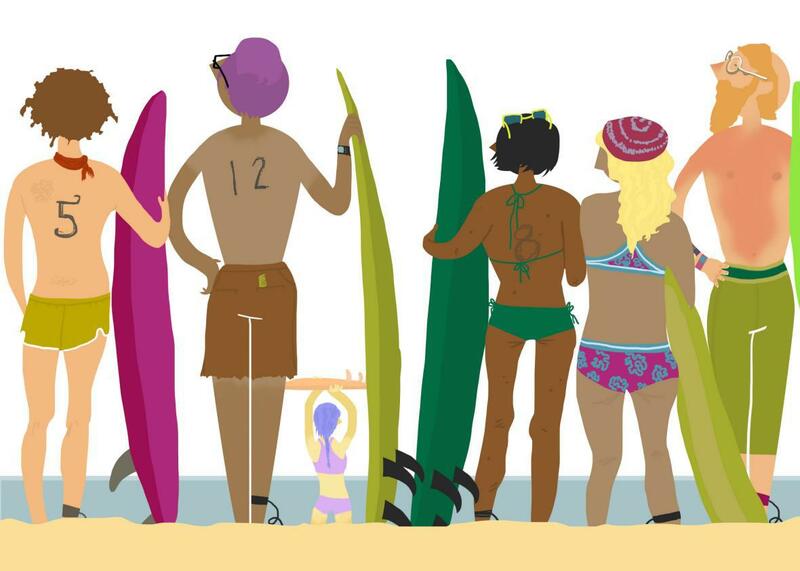 The reason is simple: increasingly thick hordes of other surfers. As a relative newbie myself, I recognize the hypocrisy of my complaint, which certainly isn’t a new one. After all, surfing veterans have been grousing for decades about the ever-growing ranks of “kooks”—clueless rookies—invading their home breaks. But even a fledgling surfer can see that overcrowding on the waves these days is real—and posing a threat to what many long-timers call the “soul” of the sport. While it’s hard to say what’s caused the new influx of surfers, it likely has at least something to do with the endless feedback loop of surfing coverage in mainstream media (which encourages more people to surf, prompting yet more coverage). Once relegated to the pages of niche magazines and surf blog discussion threads, “surf culture” is now touted in trendy outlets such as GQ, Vice, and Huffington Post; surf-themed fashion spreads recently appeared in Men’s Journal, Vogue, and Harper’s Bazaar; and even chichi retail outfits such as Serena & Lily, which sells high-thread-count linens to the 1 percent, recently began hawking limited-edition surfboards. The sport is promoted more heavily still on social media platforms, where the number of Instagram “surfer babes” and uploaded amateur GoPro surfing clips seems to multiply every week. Others have opined that surfing’s popularity surge is partly due to the steep increase in competitive surf tournaments, many of them sponsored by commercial promoters offering lucrative endorsement deals as well as cachet to high-ranking participants. According to author Matt Warshaw’s Encyclopedia of Surfing, while about 24 internationally ranked contests were held per year in the early to mid-1990s, these days that number has more than doubled. In addition to the pro tournaments on the World Championship Tour, those competitions now include the World Qualifying Series—effectively a minor league for the sport. In September, meanwhile, surfing was proposed for inclusion in the 2020 Olympic Games. On the face of it, none of this seems like a particularly bad thing. Most any sport, it could be argued, benefits from increased recognition and participation, which create new opportunities for athletes, open the sport up to new groups (like, in surfing’s case, women), and pave the way for the sport to develop and advance. And if something is worth discovering, it’s bound to get discovered—which is why surfers grumbling over Johnny Utah–come-latelies can easily seem like so many other curmudgeonly groups: early adopters of gentrifying neighborhoods; indie music fans whose favorite bands have outgrown them and signed to major record labels; and even enthusiasts of other “extreme” sports (say mixed martial arts), which were once marginal but now fill stadiums. In other words, the more surfers there are vying for waves and acclaim and rankings, the more the very spirit of surfing changes. Lineups (the spots where waves break and surfers converge) become less hospitable for peace-seekers and more the territory of contenders jockeying for wave ownership. One sign that this sort of degradation may already be happening is the uptick in documented incidents of “surf rage,”when beefs between surfers lead to fistfights. In a few surf communities, such as Australia’s Gold Coast, these have become so prevalent that city councils have had to consider adopting preventive measures, like a color-coded rating system that would ostensibly keep surfers on their rightful waves. But why, some might ask, don’t the folks that the old guard used to call “soul surfers” simply move on? Aren’t there enough waves for everyone? 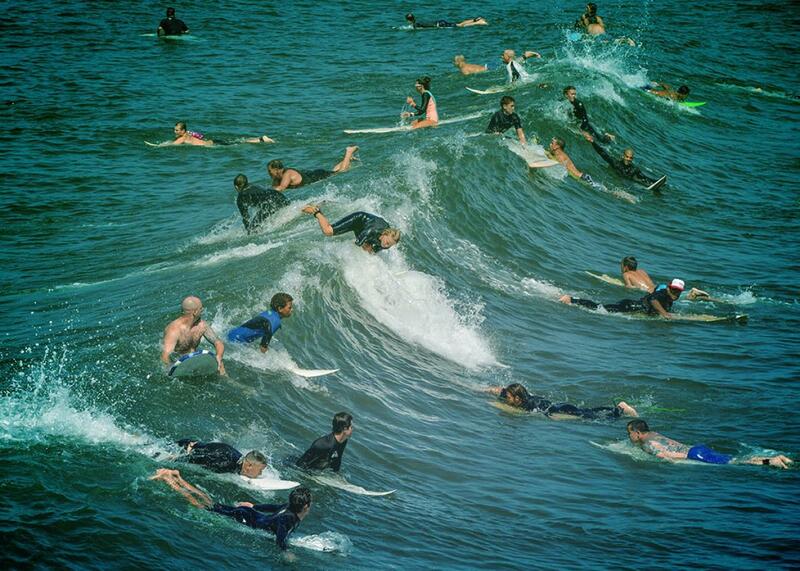 Surfers crowd waves on the California coast in 2014. Nelsen said that it’s impossible to measure how many such spots around the world are at imminent risk; most simply aren’t being actively monitored by conservation organizations such as Surfrider, which only can cover a fraction of the globe. But the threats to them are myriad—ranging from acute hazards, like storm surges and coastal development projects that critically change shoreline topography, to chronic, slow-moving ones, like ocean litter and rising sea levels due to climate change. (According to the U.S. Environmental Protection Agency, seas have risen almost 8 inches since 1870 and are projected to rise up another 4 feet by 2100. )* Surfrider currently has 92 active campaigns underway, just in the U.S., to help counteract these threats. The risks to surf spots have become so critical, in fact—and the desire to standardize waves for surf tournaments so fierce—that in the past decade, at least eight attempts have been made to engineer artificial breaks. These have all, thus far, been unsuccessful—but the latest, a much hyped inland wave pool unveiled in December by legendary surf champion Kelly Slater, has yet to prove itself one way or another. To me—the sort of person who gravitated toward surfing for its promise of unity with nature—this vision of the future, where waves are built by architects and machines, not only seems bleak; it seems antithetical to surfing’s very essence. But, to be fair, there are obviously potential upsides to the influx of new surfers. “If you think about it, the more people there are surfing, the more people there are who care about the ocean—which is always a good thing, at least from a conservation standpoint,” Nelsen said. It’s an encouraging thought, and one to try to take comfort in. In the meantime, though, surfers who crave alone time may need to start thinking further outside the traditional lineup. For instance, I recently began to consider joining the thin ranks of intrepid New England surfers who hit the waves during winter. At this point, braving water temperatures of 35 degrees Fahrenheit just might be the price one has to pay to catch a free wave.